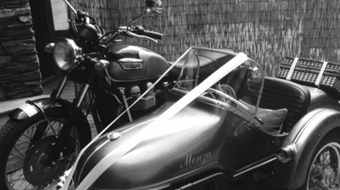 What better combination than two British classics in the form of our beautiful looking Triumph Bonneville with Watsonian Sidecar. 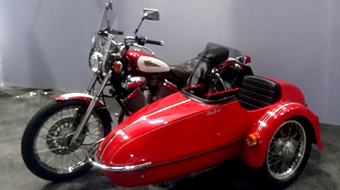 Tailoring the hire of our sidecar to suit your requirements is simply what we do. We’re here to make a special day, extra special and to help to create a memory that among those few, will last a lifetime. 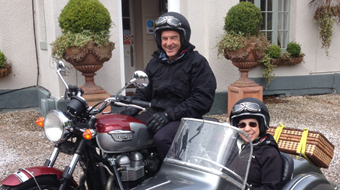 To ensure you enjoy the self drive hire of our sidecar combination we include free basic tuition, covering the riding techniques required to help keep you and your passenger’s safe. Please be clear, these sidecar combinations are very different in their behavior to that of a solo motorbike, it is for this reason that all hirers will be required to complete an introduction/check ride before self drive hire may commence. Looking for a unique way to promote your new product or services? Why not choose one of our sidecars. You could add your company logo and create that memorable 1st impression. We find the sidecars most commonly used as part of a static display but maybe you'd like to offer a mini chauffeured experience. A refundable security deposit of £1000 is required before (self drive) hire may commence, you may leave your own vehicle if suitable to do so. You'll be please to know we include insurance, breakdown recovery and a fair mileage allowance, making it a hassle free experience. If you are hiring on a self drive basis then you must be at least 25 years of age and have held your full motorcycle licence for at least two years.